Bro. Rodney rallied strong Black men in the Philadelphia community to march through Gray’s Ferry. And fearing that the racial tension within the Philadelphia Black community and White community would erupt in violence over this issue, Mayor Rendell petitioned the Hon. Min. 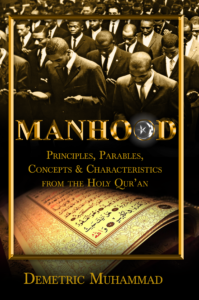 Louis Farrakhan to come to the city of Philadelphia to share divine guidance that would result in bringing about peace,mutual respect and understanding to avoid a potentially violent confrontation. 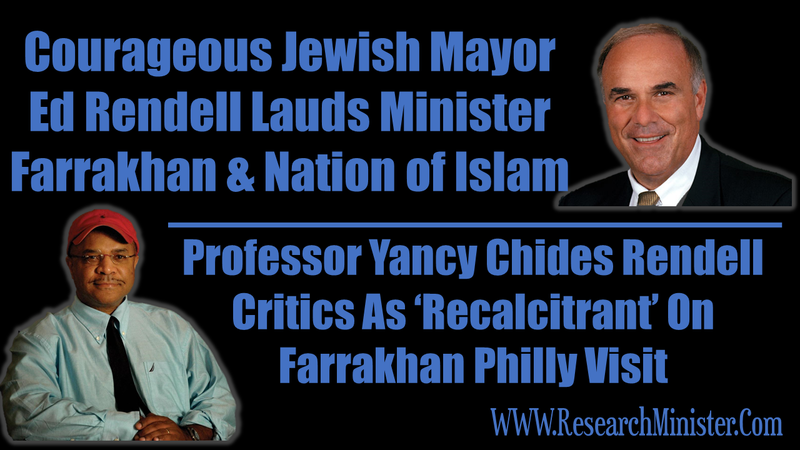 Watch below to see Mayor Rendell’s strong commentary on Minister Farrakhan, Minister Rodney and the long history of the Nation of Islam. As a member of the Jewish community Mayor Rendell’s expressions of gratitude and respect to Minister Farrakhan and the Nation of Islam caused various Jewish leaders to chastise him. Brilliant Professor and Scholar, Bro. George Yancey wrote an open letter to 6 leaders of Jewish groups to defend Mayor Rendell, Minister Farrakhan and the citizenry of Philadelphia who, as community stakeholders of goodwill, welcomed the coming together of the Minister and the Mayor. Rabbi Albert E. Gabbai, President of the Board of Rabbis of Greater Philadelphia. Needless to say, I was appalled by the lynch mob tactics of many Jewish leaders in their response to Philadelphia Mayor Ed Rendell’s commendable decision to have invited the honorable Minister Louis Farrakhan to participate in a city-organized rally. I say “lynch mob” because of their blind group cohesiveness, myopic vision, threatening undertones, etc. As I read through the “Jewish Exponent,” I thought to myself: “These Jews are really out for blood! Each article expressed an unchallenged sense of authority and moral superiority. As each article expressed its disagreement with Rendell’s decision, I continued to see the image of a parent scolding its child. The parental image went something like this: “Ed Rendell, you’ve been a very bad Jewish boy. Now if you want to continue to be a part of the greater Jewish fold, you had better show your true Jewish colors and denounce Farrakhan, the anti-Semite. If you don’t, you will not benefit from our wealth, control and power here in Philadelphia and across the country. We have power, we have money and we have influence over other powerful individuals. What you did was a naughty thing and you should apologize for your ways. In fact, you should make a public apology, swearing never to share the same platform with Farrakhan ever again. To hell with the greater racial good of Philadelphia, the likes of Farrakhan and our hatred toward him takes precedence over everything else. Therefore, take this public spanking and regain yourself-respect as a real Jew.” In short, what Jewish leaders were really saying to Rendell is that you should remember from whence your power comes. I, however, would like to commend Mayor Ed Rendell. He demonstrated an incredible willingness to risk so much. He demonstrated ethical responsibility and a utilitarian vision for the greater good of this city. He demonstrated an individual moral stand and challenged the presumption that the Jewish identity is a monolithic identity. 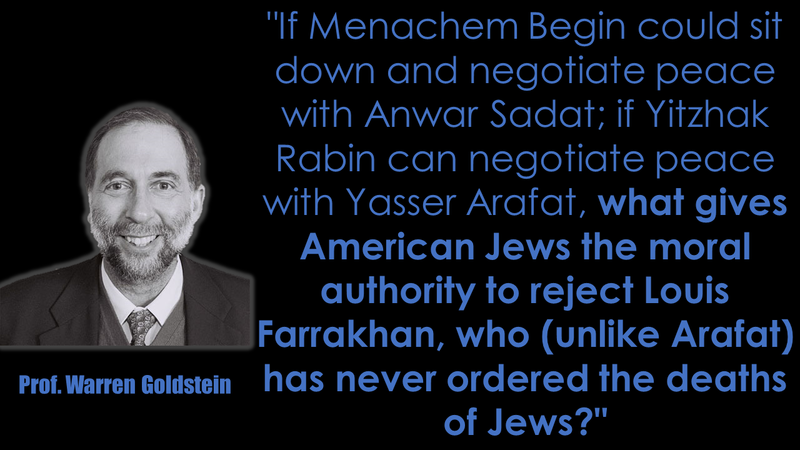 He proved that to be Jewish it is not required that one agrees with the powerful Jewish elite. But he also demonstrated to other Jews that it is time to exercise some of the principles of the Torah, which stresses the value of caring for others. Perhaps I need to remind you of what the Jewish attitude involves. As the Jewish intellectual Michael Lerner writes, “The Jewish attitude is that the world is not a timeless and fixed entity but a being that is sustained every day by the intention of its creator. Moreover, human beings are created in the image of God, and charged to be partners with God in the process of changing the world from that which is to that which ought to be.” Also, Jewish leaders have apparently forgotten the Torah commandment: “Ve-ahavta la-ger” or “Thou shalt love the stranger.” Clearly, the Torah expresses mighty moral and ethical principles. I only ask Jewish leaders: “Can you abide by them?” Whether knowingly or not, Mayor Ed Rendell has shown the type of behavior certainly consistent with the Torah’s teachings. He is to be commended for taking the higher ground. Now, of course, two inferences that one might draw from this is that either major Jewish leaders are not obedient followers of the Torah, or they are living a rather contradictory existence. Which is it? How can we walk in the direction of unity without open communication? As Jewish leaders, you must remove the blinders that prevent you from sitting down with Farrakhan. If Farrakhan has any blinders, he is at least willing to sit down and open himself up to dialogue and to possible change where necessary. Farrakhan has long offered his hand in peace and understanding. Correct me if I’m wrong, but Adolf Hitler never attempted to rethink his attitude toward Jews as they were marched off to the ovens. Hitler was apparently not open to dialogue. He didn’t openly proclaim his non-hatred toward Jews. So, why the comparison of Hitler or neo-Naziism to Farrakhan? Hitler was never willing to get beyond the conflict and the misunderstanding. This does not sound like Minister Louis Farrakhan. Instead of Jewish leaders fuming over Rendell’s decision, they should follow his example. As Jewish leaders, you ought to shine as moral paradigms. Show the world that you are capable of acts of selflessness and understanding. I am sure that there are many conceptual points held by Farrakhan which Mayor Rendell would find necessary to take issue with. But, for a larger good, he put aside his differences and conversed and united with Farrakhan. The United Methodist Church will be remembered as a site of mutual peace and as a site of mutual reconciliation in the name of a higher good. As Jewish leaders you expend so much energy sitting around complaining about things that Farrakhan has allegedly said. You constantly complain that he called Judaism a gutter religion; that he said that Hitler was a great man; that the state of Israel is an outlaw act; that the Jews are skunks and that they are not the chosen people of God; that German Jews financed Hitler; that Jews are wicked deceivers; that Jews hold Black people in their oppressive grip; that Jews have an incredible amount of power over the United States government; etc. Well, there are two ways of dealing with Farrakhan on these points. You can either continue to use such alleged statements as fodder for continual misunderstanding and division or you can invite him to an open conversation where he can then respond to much of what is being held against him. Thus far, you would rather hold these things against him. It is possible that it is fear that prevents you from meeting with him? Was it pain and suffering that has led them to become so reactionary in the face of constructive criticism? Farrakhan is quite capable of defending himself. Now, of course, at such a meeting, there can also be an open discussion about the role that Jews played in the slave trade, their impact on the media, their relationship to Black culture, their role in exploiting Black neighborhoods, etc. Indeed, I would like to see a nationally aired discussion between Jewish leaders and Farrakhan around all of the above issues. The intent of such a nationally aired discussion would involve the clarification of issues and an expressed desire to move toward greater unity. 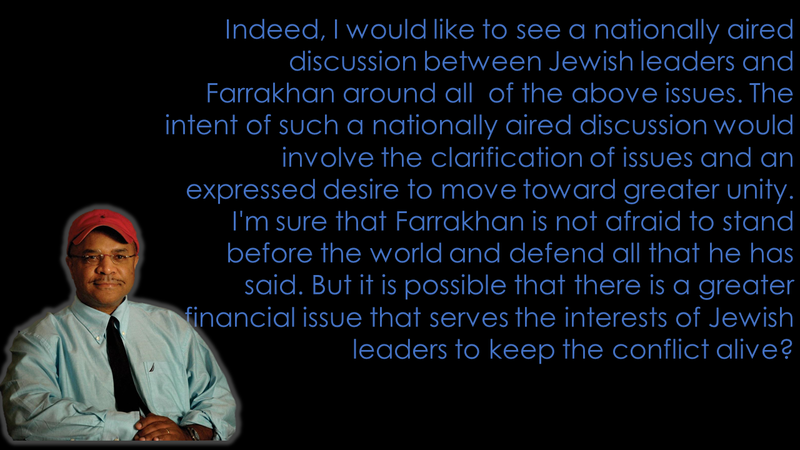 I’m sure that Farrakhan is not afraid to stand before the world and defend all that he has said. But it is possible that there is a greater financial issue that serves the interests of Jewish leaders to keep the conflict alive? Now, in your tract, the “Jewish Exponent,” there were a few other rather depressing claims made. Contrary to Murry Friedman’s claim that the city bowed to bigotry, I believe that Philadelphia (the so called city of brotherly love) finally acted in accordance with its name. And, indeed, Rendell’s decision was very consistent with such a vision of brotherly love. Farrakhan did not engage in any deceptive or sneaky act of coercion that resulted in Rendell’s admonishment of him to call off the march in favor of a rally at Tindley Temple United Methodist Church. Keep in mind that it was acts of white racism, at the site of Grays Ferry, against a Black women and her family that brought Farrakhan to Philadelphia. So, he did not coerce anyone. Also, contrary to another caption in the “Jewish exponent,” Mayor Rendell’s deal with Farrakhan was not a dance with the devil. First of all, Farrakhan should not be characterized in demonic terms. Secondly, if there was any dance performance, then it was an orchestrated dance of peace between two individuals, Farrakhan and Rendell, who were willing to dance together for a purpose greater than the two of them. If anything, it is those who are willing to block the road to peace that are dancing with the devil. It’s a dance of hatred, a dance of confusion, and a dance of misunderstanding, the result of which can only bring greater division and greater destructiveness between so many African-Americans who respect Farrakhan’s leadership and those Jews who see him as the reincarnation of Hitler. Also, you should keep in mind that Mayor Rendell’s deal with Farrakhan doesn’t give Farrakhan legitimacy; for in the eyes of many Blacks and some Jews he already has legitimacy. So, it is an error to say that Rendell gives legitimacy to Farrakhan. His legitimacy was already overwhelmingly confirmed at the Million Man March. Although I have felt compelled to write this open letter, there is much in me that is pessimistic. As key Jewish leaders, I feel that you have become recalcitrant in your ways; that you have perhaps lost the faith of the Torah; and, that you have been so threatened, historically, as a people that you see persecution all about you where it possibly doesn’t exist. I assure you that Farrakhan is the least of your worries. You should concentrate your efforts against white militia groups which would rather see both Blacks and Jews extinct. If Farrakhan says that he is willing to meet, then meet with him. What will you loose? If Farrakhan is a bigot, then use this opportunity to prove it. If he is an anti-Semite, then use this time to demonstrate it; and if he hates Jews, this can be brought to light. But what manner of man is Minister Farrakhan such that he hates Jews so much and yet he is willing to sit down and talk and break bread with them? Perhaps you can resolve this apparent mystery for me. But until then, take the higher ground, the opportunity has been offered. When a space of potential reconciliation has been created and you refuse, then it is you who stand as the morally inferior, the ethically unresponsive, and the bigot with an imaginary ax to grind. Other Jews are beginning to see the light. Your moral leadership is needed. The world is watching.